With it's flavorful language, reggae tunes and spicy culture, Jamaica will have you relaxed and "chillin" in no time! With it's amazing land, rich history, and musical influence, Jamaica will have you begging for more. Jamaica is the home to beautiful beaches, magnificent mountains, rushing rivers and cascading waterfalls. Float down a river on a bamboo raft made for two. A guide poles the raft down the many rivers while you effortlessly enjoy the scenery. Explore Duhn's River Falls, holding hands with your loved one, not only for the romance but also for balance. Wear a swimsuit and sneakers and enjoy a day full of romantic fun. Book a Honeymoon Villa Suite at Cibony Ocho Rios. Here you can enjoy your own abandon, private courtyard with a pool and whirlpool, perfect for that romantic privacy. Escape from the tourist areas and rent a villa in Port Antonio, one of the most secluded spots on the island. If it's partying your looking for, the Renaissance Jamaica Grande is perfect. Everynight they hold a Grande theme party with buffets, beach parties, poolside barbecues and more. Here there is never a dull moment. 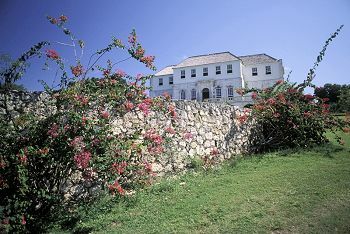 Jamaica is known to be the golf destination of the Caribbean. Deep sea charters are available at most resorts. catch a game of cricket or polo, both very popluar games in Kingston. Shopping is great in Jamaica. Jamaican artists use the culture and essence of their country in wood carvings, sculptures and paintings. The best time to visit Jamaica is from July to August and November to March. The Jamaican economy is heavily dependent on services, which now account for 70% of GDP. The country continues to derive most of its foreign exchange from tourism, remittances, and bauxite/alumina. The global economic slowdown, particularly after the terrorist attacks in the US on 11 September 2002, stunted economic growth; the economy rebounded moderately in 2003, with one of the best tourist seasons on record. But the Jamaica economy faces serious long-term problems: high interest rates; increased foreign competition; a pressured, sometimes sliding, exchange rate; a sizable merchandise trade deficit; large-scale unemployment; and a growing internal debt, the result of government bailouts to ailing sectors of the economy.